If you're anything like me then you know that the taste of a big cup of joe (coffee - of course) is simply deeelightful. For 7 years, coffee was my drink of choice. I'd look forward to having it in the morning and mid to late afternoon. Yep, I'd drink a cup of coffee twice a day. Toward the end up 2017 I realized that my energy levels were always low, I'd feel anxious all of the time and I'd constantly have headaches. After a little bit of research, I found that coffee could potentially be the cause. To see if that was the case, I quit cold turkey. Let me tell ya, that wasn’t smart. The withdraws were rough. However, this is how I discovered matcha! I researched an alternative to coffee - and there it was. After about a week or two, I finally started to feel like myself again. My energy levels were higher, my anxiety decreased dramatically and my headaches went away! I don’t get the same horrible side effects with match that I get with coffee because matcha releases the caffeine slower into the body over a 6-8 hours period. Coffee on the other hand, causes a rapid 30 minute spike. Don't get me wrong, I still enjoy a cup of coffee every now and again. However, matcha is now my go to. Give this recipe a try and let me know what you think! 1. Bring 4oz of water to a boil. If you have a Keurig, you can just set it to dispense 4oz of hot water into a large mug. You'll want to have a big enough mug to whisk the water inside. 2. 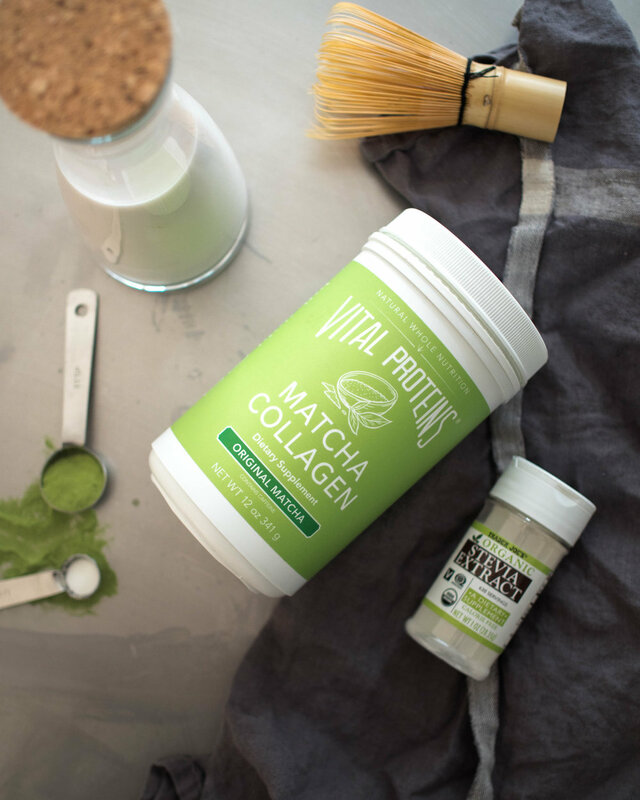 Add a scoop of Vital Proteins Original Matcha with Collagen to the hot water. There should be a scooper provided in packaging. 3. Add a pinch of Stevia extract . If you purchased the Trader Joe's brand powder brand, just use 1 scoop of the little spoon provided. 4. Add 3-4 ice cubes to the hot water, matcha and stevia mix. 5. Pour the 8oz of almond milk onto the hot water, matcha and stevia mix. 6. Stir up and enjoy!